A tasty snook caught in the surf with a Yo-Zuri minnow. 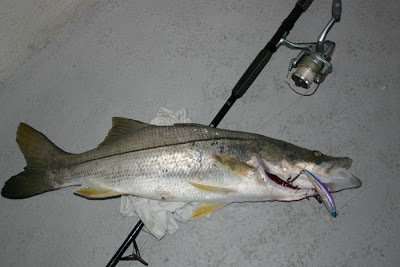 October 1, 2011 and the mullet run is in full force with billions of mullet making their annual migration down the beach shadowed by predators of every sort; tarpon, snook, bluefish, jacks, Spanish mackerel, sharks, ladyfish, trout, redfish and others. It's almost impossible to drop a baited hook or lure in the water without it being immediately crushed by a hungry something. UPDATE 10-16 - The sold numbers for condos changed since the original post when the tardy listing agents finally recorded their sales for September. I edited the numbers below to reflect the changes. The trend didn't change, just the total sales. 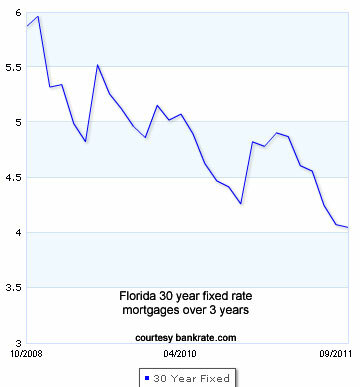 Mortgage rates continued their drop in September with the average 30 year fixed rate hovering just above 4%. That extremely low rate didn't seem to be a factor as far as condo sales were concerned in Cocoa Beach and Cape Canaveral. 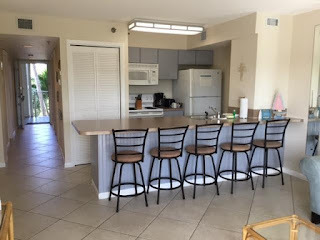 Of the 32 condo sales in September recorded on the Cocoa Beach MLS, 25 or 78%, closed for cash. Things were a little different with single family home sales with only three out of eight (38%) closing for cash. Two of the eight single family home sales were foreclosures but there were no short sales closed in the month. The highest sale was a foreclosed 5 bedroom canal home in the Cocoa Beach Country Club area that sold for $680,000. The lowest price was $155,000 for 3/2 in Harbor Heights, the other foreclosure. It sold after 14 days on the market for $5000 more than asking price. Another of the Enclave of Cocoa Beach homes closed, this one for $515,000. The eight homes closed for an average of 95% of last asking price. No condos closed in the month for more than $349,000. Slightly more than half were oceanfront. Of the 32 recorded sales, 47% were distressed, seven foreclosures and eight short sales. The short sales took an average of 105 days from contract to close. The 32 condos sold for an average of 91% of last asking price. Condo inventory in Cocoa Beach and Cape Canaveral this morning stands at 365 units, seven of those in a yet-to-be-built building and 15 at Mystic Vistas. There are 39 listings asking more than $500,000. Ten units have closed for more than $500,000 in 2011. By contrast, 150 units have closed for less than $100,000 this year with just 55 units actively for sale right now asking less than $100,000. [update 10-16] What I forgot to mention in the post above was the extreme fall-off in the number of condo sales. With 32 recorded condo sales, September 2011 was the slowest month this year. We have to go back to December 2009 to find a month with fewer sales. With inventory at such a depleted level this trend is likely to continue. It's getting very difficult to find attractive deals in the well picked-over MLS and priced-right new listings are selling quickly. A third of all sales in September sold in less than 30 days on the market. The more specific a buyer's criteria, the faster he should be prepared to move when a matching property gets listed or price-dropped into reasonable range. The temp was in the low 60s this morning when the sun rose over the ocean and highs for the next 10 days are not expected to exceed 84. It's a great time to be in Cocoa Beach. Our summer visitors are gone for the most part and the winter guests have yet to arrive. The beaches are deserted, there is very little traffic and you can walk onto the Cocoa Beach Country Club golf course without a tee time. Not to mention the fishing is on fire and the occasional passing tropical storm blesses us with clean surf. See you on the beach or in the water.